You know those gaudy wolf shirts you always see on fat dudes at Wal-Mart and in truck stop gift shops? 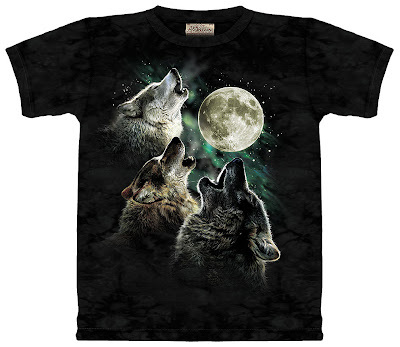 Right now there's one on Amazon, dubbed the "Three Wolf Moon" shirt, that's selling like hot cakes thanks to a prank started by a humor Web site. Read about it here. Be sure to go to the Amazon page and scan the reviews, which will give you cramps from laughing so hard. I'm a men's large, by the way, if anyone wants to get me a Memorial Day gift. It would look great under the hipster-turd flannel I just bought on the clearance rack at Urban Outfitters.